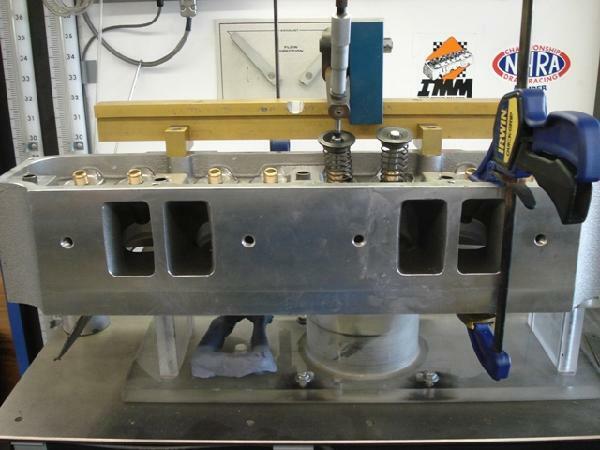 Cylinder head porting is one of our major attributes. We understand that raw flow numbers are not the end all to making horsepower. It takes a careful balance of flow, airspeed, port cross-section, and choosing the right components to get the most out of any cylinder head. We spend countless hours flowing, testing, and we do use epoxy when needed. Believe it or not, the best porting is not always removing metal. Adding to areas in the intake port that are dead or adjusting wet-flow in the port to help eliminate plug wetting are just a few of many details we use to make sure that when you get your heads back from us you have the most power from your hard earned dollar! PERIOD!! We use a Superflow 600 bench outfitted with the Flowcom computer so we can measure air speed in feet per second (fps) to map the ports for too high or too low airspeed. Yes, you can get too much velocity in the intake port causing air seperation from the intake shortturn. We have over 20 years of porting experience in all forms of racing and performance engines.